As our understanding of neurobiology and the psychosocial nature of pain continues to grow, so does the number of people affected by it: while 27% of Americans reported chronic pain in 1998, 37% did so in 2010 (1). 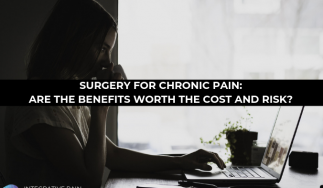 Today, 100 million American adults (about 35%) are affected by chronic pain, and regrettably, this burden is ill-matched by pain management across health professions (2). 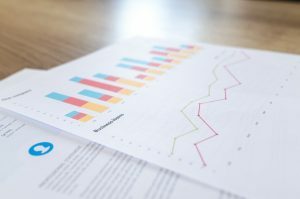 In previous blogs, I’ve talked about important gaps in pain education received by healthcare professionals, including doctors and physical therapists. Now, we’ll look at the status of pain education in Occupational Therapy school. Is the education OTs receive in school with regard to pain science and pain education sufficient to meet the challenges of the patients they treat? Occupational therapists (OTs) work with people of all ages to improve activities of daily living in the home, outdoors, and in learning and working environments. This includes assistance in developing, recovering, or maintaining both cognitive and physical skills, such as interpreting information, using a computer, commuting, shopping, dressing, bathing, and cooking. Pain is relatively common in OT patients, and can critically interfere with occupational performance and daily life. A solid understanding of the cause, context, and management of pain, as well as an appropriate attitude about pain and the people who experience pain, are all important assets in the practice of Occupational Therapy (3). Two recent studies shed light on the extent of pain knowledge and attitudes in OT graduates. The first study involved 354 Canadian OTs working within the community as well as out of private practices, who were surveyed using the City of Boston’s Rehabilitation Professionals’ Knowledge and Attitude Survey (COBS) (4). Of particular concern, 45.7% of OT participants believed that malingering is common among people with chronic pain; 38% believed that pain intensity cannot be objectively measured, 39.7% believed people with pain over-report their pain, and 59.8% believed that opioid addiction is likely to occur in more than 5% of the patient population. An overarching perception was that many OTs showed over reliance on their own tacit knowledge and clinical reasoning when gauging their clients’ pain intensity. Matched with distrust in standardized measures of pain, this suggests that educational gaps are compensated for with” intuition”, which may serve to forge a sense of self-efficacy and professionalism. The second study, conducted at Tufts University in Massachusetts, evaluated pain knowledge and pain attitudes in 194 OT students enrolled in a master’s degree program (5). Applying the COBS again, two tests were administered, one on the first day of class and the other at the end of the 13-week course. The second included two classes specifically devoted to pain management taught by an OT educator with pain expertise. 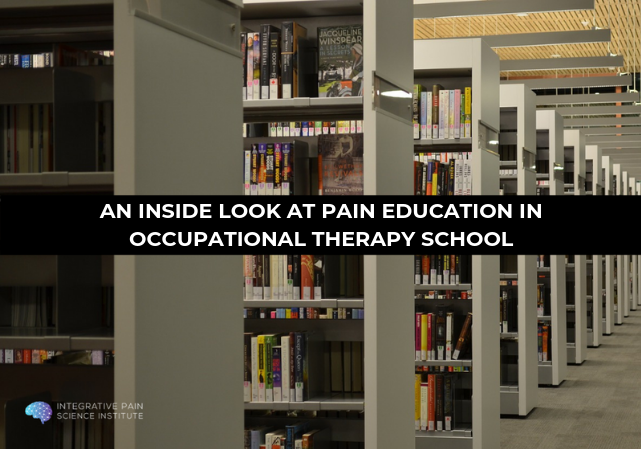 Results showed that baseline level of pain knowledge among OT students was generally low, but there was significant improvement after the course. Specifically, only 68 (35.1%) students achieved a COBS score considered adequate (≥30) on the pre-test, whereas 178 (91.8%) achieved an adequate score on the post-test. Practitioners’ overreliance on their own intuition when assessing patients’ reports of pain. Common myths and misconceptions surrounding people’s pain experiences take root during an OTs’ formative years. If not improved, they will be translated into practice. 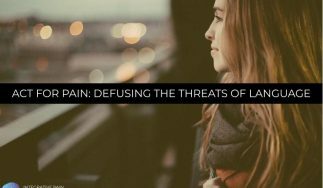 Effective instruction on pain science is required to eradicate these biased perceptions. Interestingly, both surveys showed that up to a third of respondents did not clearly grasp important differences and similarities between acute and chronic pain (e.g. the usefulness of non-drug interventions for treating severe pain, and acute pain as a potential antecedent to chronic pain). This is especially worrisome, as chronic pain affects many OT clients, and is prevalent, for example, in those with cancer. While these two studies did not directly assess pain content and teaching time in OT schools, they demonstrate that pain education received by OT students in North America is less than adequate. Mirroring previous findings (prior to 2000), these results demonstrate that for well over a decade there has been a lack of resources invested in pain education in OT schools. Improvements are clearly needed (6, 7, 8). There is a paucity of research that directly examines pain education in OT schools’ curricula; what is taught, how much time is devoted, and whether contents reflect our growing understanding of the multidimensional nature of pain. For instance, it is unclear if, and to what extent, the IASP Pain Curriculum for Students of Occupational Therapy is incorporated in accredited OT programs. This kind of assessment is an essential starting point to adjust and update pain education standards, and to help a growing chronic pain population live fuller, satisfying lives. 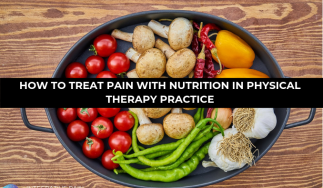 Occupational therapists play an important role as members of a multidisciplinary pain team, applying many aspects of health care in their effort to help people live beyond their pain. All clinicians that treat pain require not only a contemporary understanding of pain science, but also skills in advanced pain education, coaching, and counseling. Share your experience in pain care, and feel free to share how your school might have better prepared you to treat patients with pain. Leave a comment below or on the Institute’s Facebook page. 1- Grol-Prokopczyk, H. (2017). Sociodemographic disparities in chronic pain, based on 12-year longitudinal data. Pain, 158(2), 313. 2- IOM Committee on Advancing Pain Research Care. Relieving Pain in America: A Blueprint for Transforming Prevention, Care, Education, and Research. Institute of Medicine. Washington (DC): National Academies Press; 2011. 3- Hill, W. (2016). The role of occupational therapy in pain management. Anaesthesia & Intensive Care Medicine, 17(9), 451-453. 4- Reyes, A. N., & Brown, C. A. (2016). Occupational therapists’ pain knowledge: a national survey. Disability and rehabilitation, 38(13), 1309-1317. 5- Rochman, D. L., Sheehan, M. J., & Kulich, R. J. (2013). Evaluation of a pain curriculum for occupational therapists: experiences from a master’s-level graduate program over six years. Disability and rehabilitation, 35(22), 1933-1940. 6- Turnquist K, Engel J. Occupational therapists’ experience and knowledge of pain in children. Phys Occup Ther Pediatr 1994;14:35–51. 7- Strong, J., Tooth, L., & Unruh, A. (1999). Knowledge about pain among newly graduated occupational therapists: Relevance for curriculum development. Canadian Journal of Occupational Therapy, 66(5), 221-228. 8- Rochman, D. L. (1998). Students’ knowledge of pain: A survey of four schools. Occupational Therapy International, 5(2), 140-154. It makes sense that people might have a hard time when it comes to working all the time. Ensuring that they have comfortable means is a good way to ensure that they aren’t too stressed! That’s definitely something to keep in mind when designing an office.